Sangma Xie a, Bing Liu b,c,d,e, Jiaojian Wang f, Yuan Zhoug h, Yue Cui b,c,d, Ming Song b,c,d, Yunchun Chen i, Peng Li j,k, Lin Lu j,k, Luxian Lv l,m, Huaning Wang i, Hao Yan j,k, Jun Yan j,k, Hongxing Zhang l,n,Dai Zhang j,k,o, Tianzi Jiang b,c,d,e,f,. Auditory verbal hallucinations (AVH) are one of the cardinal symptoms of schizophrenia, and are proposed to be associatedwith altered integrity of the left perisylvian language pathways. There is considerable heterogeneity in the pattern of white matter abnormalities across previous studies. 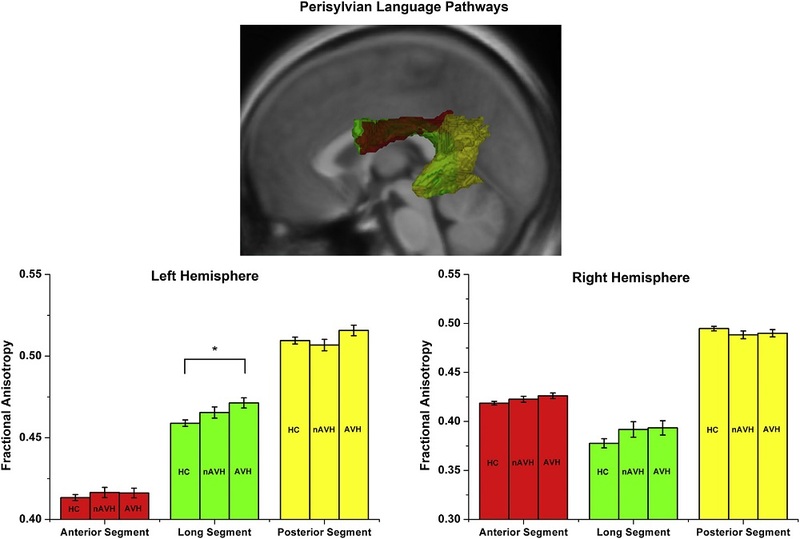 We investigated the white matter integrity of the perisylvian language pathways in schizophrenia patients with AVH based on a relatively large sample dataset fromfour different sites. 113 schizophrenia patientswith AVH, 96 patientswithout AVH(nAVH), and 269 healthy controls (HC) underwent diffusion-weighted imaging. Between-group comparisonswere performed on the fractional anisotropy (FA) values of the anterior, posterior, and long segment fasciculi within the perisylvian language network. Analysis of covariance among the 3 groups revealed the long segment of the left perisylvian language pathways was significantly different in FA value. Post hoc analysis showed that compared with the HC group, the AVH group had significantly higher FA measurements in the left long segment. The nAVH group showed intermediate FA values for this segment compared to the AVH and HC group but did not differ significantly from either group. Furthermore, the prospective meta-analyses also revealed that FA value of the left long segment was significantly higher in the AVH group compared to the HC group. Our findings suggest the hyperconnectivity pattern of the left perisylvian language pathways in the presence of AVH in schizophrenia and support the self-monitoring of inner speech model. Fig. 1. Differences in FA value between healthy controls (HC), schizophrenia patients without auditory verbal hallucinations (nAVH), and schizophrenia patients with auditory verbal hallucinations (AVH) in the anterior, long, and posterior segments of the perisylvian language network for the combined dataset. The asterisk (*) indicates a statistically significant difference at P < 0.05 with Bonferroni correction for multiple comparisons. Error bars indicate standard errors. Fig. 2. Differences in FA value between healthy controls (HC), schizophrenia patients without auditory verbal hallucinations (nAVH), and schizophrenia patients with auditory verbal hallucinations (AVH) in the long segment of the left perisylvian language network for each site (PKU6, HLG, XJ and HM). The asterisk (*) indicates a statistically significant difference at P < 0.05 with Bonferroni correction for multiple comparisons. Error bars indicate standard errors.